I want to thank Jim Morse for prompting the inclusion of this section and for supplying all its photos. Jimmy is the great great grandson of Batholomew Wilson. Bartholomew Wilson was born in Ilkeston and baptised on April 8th 1812 at St Mary’s Church, the son of James and Mary. At that time his father was described as a clock and watch maker; he was also the proprietor of the White Lion Inn at the top of Nottingham Road, as it enters what is today called White Lion Square. 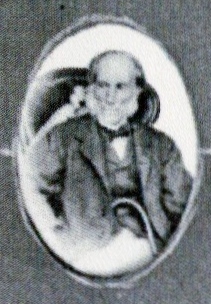 James died at his home in April 1849, aged 72 . In his will, dated November 16th 1844, he left his entire estate and possessions to his widow Mary, as long as she lived or remained a widow. On her death or remarriage James’s will stated that …. 1] … his only son Bartholomew then had a choice to make !! — he could either purchase the so-called ‘White Lion Inn’ with its garden, outbuildings and attached land, this being the family home, together with two small tenements adjoining the Inn. Or, if he did not wish to make this purchase, then the choice would be given to James’s only other living child, his daughter Elizabeth. And if she too refused, then the executors of the will were empowered to sell this property and divide the proceeds equally between the two children. 2] … James had other property, recently purchased from Thomas Ryley, and for this he gave Elizabeth the first choice — if she did not wish to buy it then Bartholomew would have the option to buy. If both refused, then once more the executors would step in, sell up, and divide the proceeds. 3] … Finally Bartholomew was given first choice to purchase all of the family furniture, bedding, plate, linen and china, and the ale brewing vessels, and the sale proceeds then being shared between the two children. 4] … There were further provision for any grandchildren should one or both his heirs die … at that time Elizabeth was married to coal agent Henry Thorpe, was living in Buckingham, and had provided James with five grandchildren. By 1862 Robert Marshall, who formerly traded as a butcher in the Market Place, had moved into the White Lion, where he was to remain with his family for the next 23 years. Bartholomew and his mother had moved into other Nottingham Road premises. On April 24th 1864 James’s widow Mary died in Nottingham Road, aged 87 … just too soon to savour her son’s ‘local government’ success. For in July 1864, Bartholomew took his place as one of the 18 members of the newly constituted Local Board in Ilkeston, at which time he was agent for the Ilkeston Gas Company. He was present at the first meeting of the Board in the Justice Room (the Old Cricket Ground Chapel) on July 12th. And just over a year later, on August 15th 1865, Bartholomew married Rebecca Anne Beetham at Bedale Yorkshire. 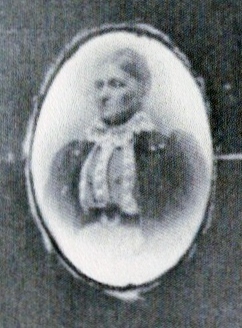 She was born on August 5th 1842, the daughter of William Midgley Beetham and Ellen (Windross) who had married at Bedale on June 1st 1840. Bartholomew was also present, as a member of the Local Board, when the Duke of Rutland laid the foundation stone for the new Town Hall on September 27th 1866. In July 1872 he became an annual subscriber to the Nottingham General Hospital, donating one guinea per year. In April 1878, Bartholomew stood once more for election to the Local Board, and was a very distant …. last !! However in September 1880 he was back ‘on Board’ after the resignation of Board member William Hewitt … an internal show of hands by the other Board members had Bartholomew ahead by eight votes to six against rival John Moss (no public election needed !!). He held his office for only a few months before, in April 1881, he was forced to stand for re-election, being one of the retiring members of the Board. At that time there was much discussion and furore within the town over the Board’s expenditure and the need for retrenchment. A Ratepayer’s Association was formed to ‘protect’ the financial interests of ‘those who had to pay’ and Bartholomew stood as one of its six candidates … perhaps relatively untainted by the Board’s past spending because of his very recent co-opting on to the Board. This time Bartholomew was successful in his attempt, one of the five Ratepayer Association nominees to be elected. In April 1881 Bartholomew was embroiled in the rancorous election of Ilkeston’s churchwardens during which he and the ‘suspended’ Vicar, John Francis Nash Eyre, displayed their mutual dislike. It was not surprising therefore that when charges of immorality were laid against the Rev. Dr. Eyre in April of the following year, Bartholomew was one of his ‘accusers’. Bartholomew and Rebecca Annie … from the personal collection of Jimmy Morse. And now let’s look at Bartholomew’s will.